These impromptu cookies were inspired by a recent phone conversation with my sister Helen. I asked her if she would be okay with being meat free while she visited my husband and I in Durham. She hesitated, mostly out of concern that she wasn’t getting enough iron on her diet. But many foods that are the richest sources of iron are actually plant based. Molasses, pumpkin seeds and oatmeal are some of the best sources of iron. One serving of pumpkin seeds has almost 25% of the RDV of iron, 1 tbsp, of molasses has 5%, oats vary with 5-25% of RDV for iron. In contrast, about 3 ounces of roast beef has less than 10% of your RDV for iron. Easy math! On to the cookies, the more important part of this post. 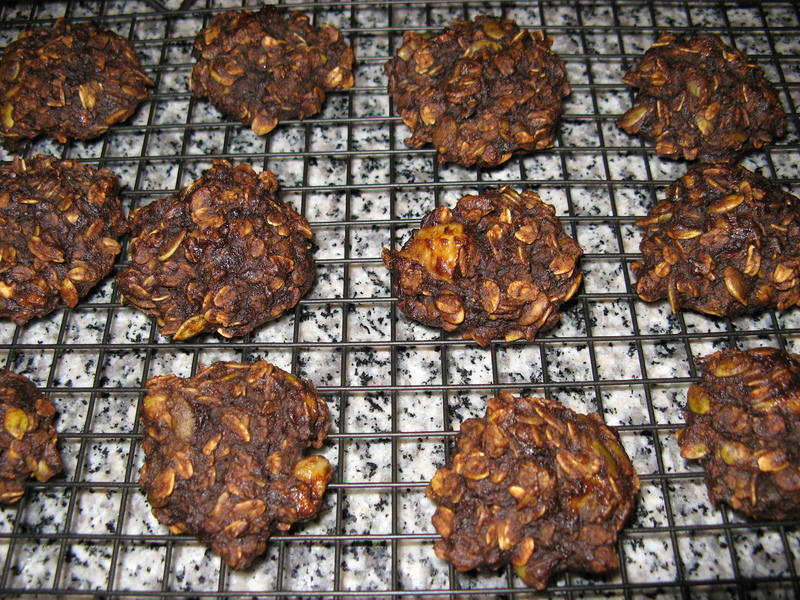 A quick nutritional analysis has these cookies clocking in with 15% of the RDV for iron and less than 100 calories. Two cookies would actually be a tasty snack that would provide 1/3 of your daily dose of iron!! Easy, yummy and hubby approved. There won’t be any left by the time my sister arrives for Thanksgiving, so we’ll have to make another batch for sure. Combine dry ingredients, stir to mix evenly. Combine wet ingredients, use whisk or hand mixer to combine. Slowly add dry to wet ingredients and blend until well mixed. Line a cookie sheet with parchment paper and bake for 10-12 minutes. Makes 12-15 cookies. Categories: Baked Goods, cookies, Desserts | Tags: baked goods, breakfast, desserts, gluten free, healthy snacks, high iron, no added sugar, vegan | Permalink.